Lovely ebony folders have been on my mind for the past couple of months. If you read my first post about folders, you’ve probably gathered that I am quite a fond of these useful tools. Randy J. Arnold, makes a variety of exceptionally beautiful wooden folders. I’ve been keeping an eye on his Etsy shop, and am increasingly impressed with each new product he has to offer. It doesn’t end with folders, or the custom boxes he builds for them. Randy makes a range of bookbinding tools, from those ebony folders I’ve had my eye on, to punching cradles and nipping presses. 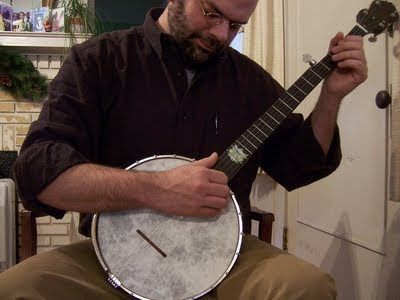 After following a few links from his shop, I stumbled upon, MaxwellBanjo.blogspot.com. It turns out that in addition to making amazing tools, Randy is a luthier and has a blog dedicated to his craft. Naturally, I was curious about what led him from banjos to bookbinding tools and my hunch was that he must have a bookbinder in his life! Randy kindly agreed to a phone interview last week, and I’m so glad, because it was so much fun to talk to him! Woodworking seems to run in his blood. 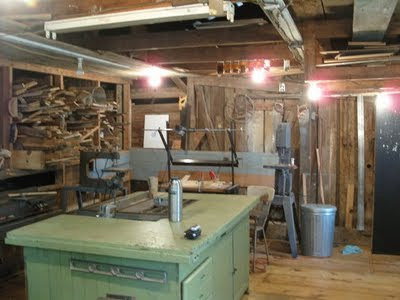 He is self taught, but was lucky to be able to observe his grandfather and father work in the family shop, which is pictured above. His grandfather worked on household projects and his father was a talented furniture maker. Randy has come a long way since those days as a young boy watching his father and grandfather; he inherited the family home and restored the shop to working order. You can read more about his efforts here and here. As far as having a bookbinder in his life, I’m proud to say that my hunch was right! Randy’s partner, the talented Amy LeePard of Painted Bunting Books is the reason he started making bookbinding tools. Amy, who studied with Amy Pirkle at the University of Alabama, initially used tools provided by the university, but found that she really needed her own, and was looking for a better quality than was readily available. That’s when Randy stepped in and made his first set of folders. Amy took her new handcrafted folders to a Julie Chen workshop and the Paper and Book Intensive. Other book workers saw these fine tools and couldn’t help but want their own! Interest and encouragement from these book workers prompted a few custom orders for individuals and beyond. Randy’s work is now offered through Colophon Book Arts Supply and through the Morgan Conservatory. You can also find his work at our favorite place, on Etsy! Like any artist, Randy looks to things around him for inspiration. His main inspiration is, of course, Amy, but inspiration also strikes when he is looking into family history, hiking, or riding his bike. As he slowly pedals down the road on his bicycle he has time to think about preliminary designs and work out any technical details of current projects. Fresh air and beautiful surroundings, as seen in the photo above, can go a long way for encouragement! I'm sure his bike rides are also a great time to think about his next choice in materials. 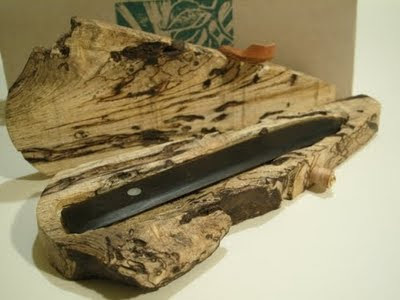 He tries to use materials that are found locally, whether it be the wood he finds from his local sources, regionally tanned leather, or spalted wood found on one of his hikes. Buying a fine tool, should be like buying a nice piece of furniture. The tool should be well made and built to last. Randy subscribes to this philosophy, and using the same tools as his father and grandfather before him, he makes tools for bookbinders that are not only delightful to look at, but rewarding to use. Randy is still a luthier and while he is finding a balance between the two, working on bookbinding equipment gives him an opportunity to employ techniques he wouldn't otherwise get to practice. There are so many things he’d like to make, it’s just a matter of deciding what to make first! A main priority is addressing Amy’s needs (naturally), but he’d love to hear what you might like to see available in his shop. He mentioned that he's working on a vertical plough, which I'd love to see! Feel free to get in touch with him or leave a comment below. Thanks again Randy, for a great conversation! Thanks for this Monica! And thanks Randy for sharing with us. Wow! It's crazy to see someone else who's life overlaps between books and banjos. I make my living making books, teaching and also playing my banjo. Lovely work!